Is there a way to use the sanyo asx- dwm 4500 on my tv without the dvd player? I dont have that. I just have the subwoofer and i cant figure out how to turn it on or hook it it up?? Please help. Ive called sanyo and ofcourse there close because of weekend. Anyone know?? The wireless speakers are great and sound good for the price range. The wireless feature was the selling point for me as I wasn't going to run wires and I have not been disappointed in that decision. The volume response is slow. If you have a part of a movie that is two loud or low, the time to change volume is longer than I would like. The picture quality is great. I wish it would play more formats like .avi, .mpg, etc. I am not sure just what all it plays but I often try videos from my digital camera(s) and it won't recognize some. Actually I was searching for what file types it would play when I ran across this site to review it. The display on the front of the player is a cool blue and looks nice. The styling is good and sound is really good. For the money, you won't be disappointed. You could spend twice the money and not get any better sound or picture. Also, I have had mine about 2 years and played lot of movies. It will play for a long time. I almost the internal FM radio tuner. I tried it out when I first bought the unit and it works good and receives stations I didn't expect to be able to receive. I don't use it for radio but it is a definite plus. I don't remember what price I paid but bought at WalMart and the price for the features was lower than other types with comparable features. Great, super product. I don't know why they stop manufacturing it. Maybe so that we can buy a more expensive one that's not as good as this one. Got it from Walmart in '07 for less than $200.00. Lost the module due to power surge. Looking to replace it with a used one. Then I'll have two rear wireless speakers! Purchased new from Walmart at end of 2005. Had to have the DVD unit replaced by Sanyo in under a year because it would not play DVD's. The 'new' unit has had problems off and on not playing DVD's. At present will not play or see a DVD so will be calling Sanyo tomorrow. Lived in Japan very long time and Sanyo has a good rep so this is a bit of a disappointment. I paid $199 in 2005 but it was a bargain at the time. good speakers, strong amp, compact in size. overall srong product. price. bought this product on clearance at best buy. its more than id expected, ive had it for over a year, with daily use and its still rockin. loud clear sound, from the highs and the bass. recomend it to others if still, being made. ideal rear wireless speaker. oh yeah dvd player plays everything. Strong radio signal for rear wireless speaker and the aux jack is great plugging in your computer system for surround sound during gaming or presentations. Could use a second rear wireless speaker. This is a great product - wish I could find another. Very stylish and is a great addition to any home. 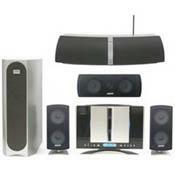 It looks and sound like the expensive systems but at less then half the price.